The Queens of the Khalsa, Bhai Shia Singh and the quest for the missing Dasam Pothis. In the Durbar of the Tenth Guru there were many poets and scribes. 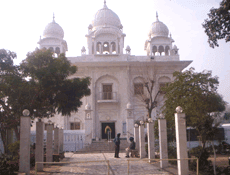 However after the accession of the Tenth Guru and during the short rule of Banda Bahadur, Delhi became the command centre of Sikh learning and Granth compilation. I have previously written about a relatively unknown scribe of the Sikh scriptures Bhai Har(i)das. I will now consider the scribe/compiler of Pothis (breviaries) and Granths known as Bhai Shia(n) Singh. In my research on the Granth of Guru Gobind Singh (Sri Dasam Granth Sahib) his name appears several times but in fact little is known about him. Using a few anecdotes I will piece together a short history of Bhai Shia Singh.